When I was a teenager, about 16 I think, I had the amazing and overwhelming experience of going on a 3-week trip to then-Soviet Union Russia and Poland. As a a member of my church choir we embarked on the trip to sing secular music, ironically, at some of the most beautiful churches in Russia and Poland. Our travels took us to Leningrad, as it was known at the time (it is now St. Petersburg); Moscow; Warsaw; Krakow and many other towns and villages. At the time I was a messed up, confused teen. I'm not sure how much the trip helped or hindered that condition, although the experience did leave an indelible lifetime imprint that in essence changed inextricably who I was and who I have become today. It wasn't a change that really happened immediately at the time. I think it was a seed that was planted that over the years following, as I aged, became more distinctly entrenched and altered the way I processed the world. In some ways I think it made me a fatalist, although I rather think that's a genetic trait that I was born with, so it simply triggered a natural condition. You could say the trip made me a darker shade of grey. That life-altering, perspective-skewing aspect of my trip to Russian and Poland in 1978 was a visit to the Nazi concentration camp, Auschwitz. 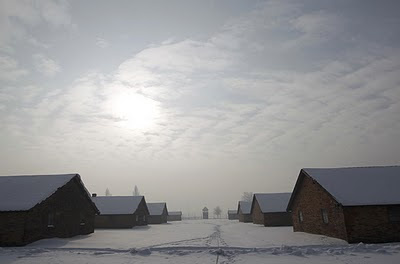 We actually visited two former concentration camps, however, the other one had been razed by the Germans and was only a memorial to the many children who died there--if I recall it was a concentration camp for children. Being a 16-year old and witnessing such human atrocities I think is a very beneficial experience. I don't know whether the visit had the same impact on my fellow choir singers--no doubt it had an equal impact on us all, but in distinctly different and unique ways. Others might have found hope from the visit that perhaps changed their lives inextricably too. But for me, a child of the 70s who lived in terror because of my homosexuality, the visit I think highlighted the world in which I lived. I understood such hatred. I had witnessed personally hatred all of my life. I don't know that I knew that so much at the time as much as it slowly dawned on me as I grew up in the years following the trip. That experience, awakened me to the world in future years with less of a naivete. Seeing actual piles of glasses/spectacles, piles of hair of the remains of some of the 1.1 million people who were exterminated at Auschwitz is something that we should all witness. Standing in front of two of the ovens where hundreds of thousands of bodies were burned in the crematoriums or standing in the showers where millions of people were gassed, or standing in front of the walls which are pockmarked with bullet holes which killed thousands more: this is something we should all see. And never forget. This is what we are. Our species is capable of this. No church, no religious institution, no political institution, no political party, no politician, no God/Goddess can illustrate or instruct us about the true basic nature of humankind, more than Auschwitz. This is what we are capable of and what we've done over the thousands of years since our existence, usually in the name of religion. We kill each other: brutally, barbarically, heinously. Our capacity as a species for love and intelligence, does not conquer all. Even with these supposed higher levels of capability, which give us a supposed advantage to the other species on our planet, look at the world that we live in today in 2010....a world that we are destroying. Look around you at the world that man has created, evolved, and which is still sometimes as barbaric and without reason as it was in the Dark Ages. After that remarkably profound and seminal personal experience at Auschwitz, I never could see the world in any other way except with an inherent unease that somehow the same thing would happen again. I could see vestiges of similar hatred all around me as a young gay man growing up in Texas in the late 70s. I still see the same vestiges of hatred, and even more startling and prevalently some 30 years later, everywhere, as a gay middle-aged man living in Southern California. Auschwitz and the Holocaust happened over 65 years ago. And I'm afraid that it will happen, no, it is happening again. It has happened in countries in Africa over the last 50 years. Never Forget The barbed wire fences serve as a reminder of the horrors of the past. There were thought to be around 7,000 survivors in the camp at the time of the liberation in 1945 with only a handful still alive. Israeli Prime Minister Netanyahu honored the victims and those who risked their lives to save Jews from the Nazis. "We encounter the worst evil in the history of mankind together with the greatest courage in the history of humanity. This is not an easy encounter but it gives us hope and direction for our future." New Day Rising The camp's barracks are pictured on the early morning of January 27, 2010. 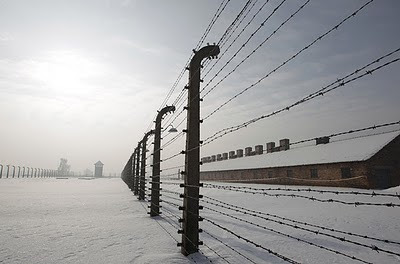 In 2005 the United Nations declared the date International Holocaust Remembrance Day. More than a million people were murdered by the Nazis at Auschwitz. One of my favorite places to visit in Washington DC is the Holocaust Museum. 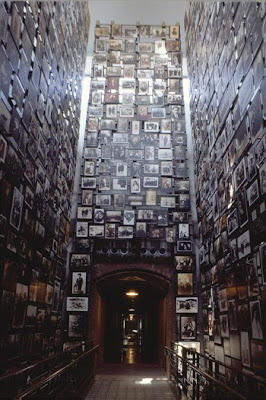 Even if you cannot make a trip to Poland to actually witness Auschwitz, do make an effort to go to this museum in DC. 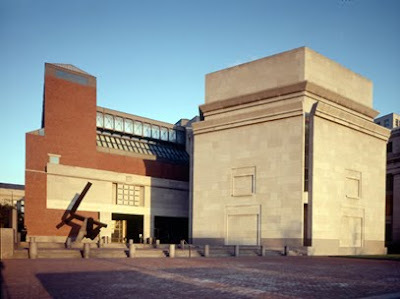 For more information, visit The United States Holocaust Memorial Museum's website for more information: http://www.ushmm.org/ . If you look around you every moment of the day, hatred is so prevalent and rampant in every aspect of our lives. I read today that Fox News is now the most trusted source of news in the US.....now that's a whole lot of hatred spewing that emanates from the most trusted news source. 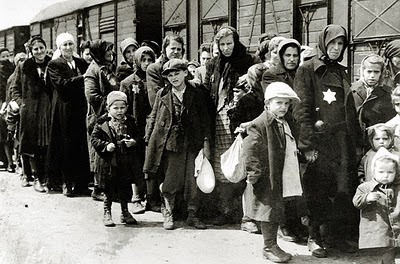 I even examine my own hatred for right-wing Republicans and Christian conservatives and I see the same base essence of our species that created an Auschwitz and its outcome approximately 65 years ago. The ushmm.org website has a very good section dedicated to genocide. Please investigate. I remember reading and listening to mythology/religion scholar Joseph Campbell in the late 80's. He made the statement, which seems even more prophetic today, that somehow in our modern technologically advancing (these days at dizzying speeds of light) world we had not evolved a new mythology in which to find a spiritual path which resonates for our times. His assertion was that, throughout man's history, societies had created mythologies that were necessary and helpful to humans and that were based upon mankind's evolutionary maturity. Campbell's observation was that we were long overdue for a new mythology which reflected our evolutionary progress. We seem as a species to be stuck at a spiritual age of a two year old, although our intellectual maturity is that of a 40 year old. When I look around today that is most evident and even more frightening than when I heard Mr. Campbell make the observation two decades ago. So this blog entry today isn't positive, I'm sorry. It is most fatalistic. We really can only do one thing though: NEVER FORGET what we are capable of. It's chilling enough to make one reconsider your own thoughts and to examine more closely the world in which you live today. I won't ever forget that visit to Auschwitz. I cannot ever forget that mankind is capable of such horrific acts. It can and will happen again. Unless we never forget. 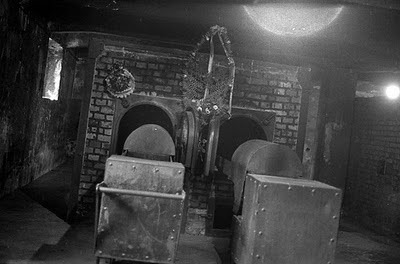 Unimaginable The ovens of Auschwitz. "The Holocaust is the tragedy which unites Europe," European Jewish Congress leader Moshe Kantor said on the eve of the anniversary, which President Barack Obama was due to address by video. I recommend you "Sarah's Key" by Tatiana de Rosnay. You'll be amazed.